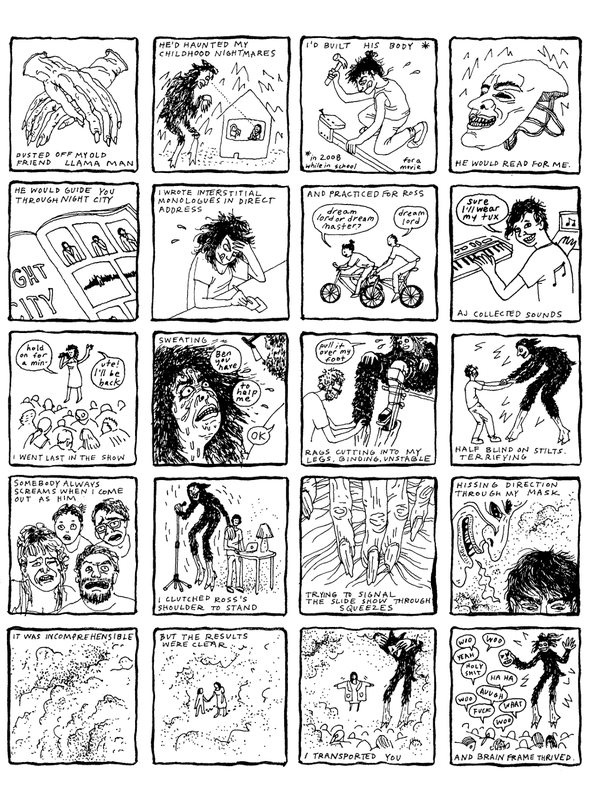 Here's another new comic, about my first performance of Night City at Brain Frame 2, my first time bringing Llama Man to the stage. This page will be published in the Brain Frame Yearbook. At the Yearbook party last week, I observed how popular it was to page through the print proof. People would grab a copy and sit in the corner for 20 minutes, myriad expressions flickering over their faces. Someone told me "I could read this for days." Another, a close friend and repeat Brain Frame performer, admitted that he hadn't been planning on buying the book. "$25 is a chunk of change," he said, "even for something I knew would be so nice." Extending his hands, he continued, "but then I saw it and you know, I really got that same feeling that I did in high school. This isn't just some thing I've participated in off and on. This is my community. These are my friends. This is the last three years of my life, and it's beautiful, and I realized that I need it, so I just bought one." In three days, on Monday, July 7th, we need to buy all the books we can to have them ready at the last show. This means that if you want a book, you need to buy it now. I can't afford much overhead for purchasing extras - a shame, since I know seeing the book in person is the most effective advertisement. This effort is 150% selfless. Each book costs $5 more to make than the price of sale (ever wonder why your high school book cost $60?). I still need to raise $2,223 by Monday. Anything that doesn't come from pre-sales will come out of my pocket. Please, put faith in your future (and your past) and buy a book this weekend. DONATE to help us make this happen. Thank you!